Thirsty Pilgrim: More, Please: Cas Beer is Out. Dropped by that craft brewery in Cartago on Monday and learned something useful: Its third and latest seasonal beer is available this week. 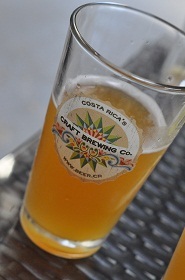 In this case it's a session-strength wheat beer made with what is arguably Costa Rica's signature fruit: cas. If I told you the Latin word for cas is Psidium friedrichsthalium, would that help? No. Much better to explain that it's a sour member of the guava family with lime-like leanings. Its most popular use is in the sweetened, fresh fruit drinks enjoyed at roadside sodas (incidentally, it also makes a killer sorbet). It's got a tangy, tart and earthy taste and smell. That shows up in the beer's aroma just enough for me to think, "Oh yeah, that's cas." The tartness is restrained and the beer is highly drinkable at 4.5% abv. Just between us, I intend to put a serious personal dent in this beer's availability. It won't last long. It's a crowd pleaser with distinct local identity. If you're keeping track, this is the third seasonal from Costa Rica's Craft Brewing Co. Like the others, this seasonal should be available at the brewery's 16 or so draft accounts (a number that is soon to grow, thanks to increased brewhouse capacity). One of those draft accounts I've failed to mention is the Hostel Galileo in San José, which I gather is a fun place that sells a hell of a lot of beer. Could be just the thing for thirsty travelers looking to overnight in the capital before or after a flight. CORRECTED to offer Latin name for Cas instead of English word "soursop," which is in fact guanabana. And which also makes a nice sorbet flavor, by the way. Can't wait to get back to CR and get a taste of their beers. One comment though, I'm pretty sure soursop is guanabana (annona muricata) not cas (psidium friedrichsthalium). I've heard cas called Costa Rican Guava or Cas Guava but I don't know how official that is. Dang, I've mixed up the soursop thing before. Should have double-checked. Thanks for the catch. Cas Guava makes enough sense. Costa Rican Guava doesn't, since CR has other types of guava and cas is not limited to CR. It grows throughout Central America and in Colombia, but it has a special place in Costa Rican hearts. Here, cas is just cas. Looking forward to trying this, hopefully tonight. Great review. Missing my IPA's down here, but this brewery's Segua is close enough. Johnson, have you got a Fresh Market near you? The Red Seal and Acme pale ales from North Coast can help with that C-hop jones (with the caveat that they're pricey and not always fresh).